This flavor was developed by Tony and Cheryl of Indigo Vapor jointly with the sadly, now defunct Project Vape A Soldier and supplied to me at no charge for the purpose of this review (Thank you Tony and Cheryl) and this is the the third of their E-Liquids I have had the pleasure of vaping. The order shipped promptly from their facility in Mishawaka, Indiana via USPS in one of the small flat rate priority mail boxes.so the S&H charge on this order would have been $5.60 I believe. However S&H is included in orders over $50.00. They also have a wide variety of sample packs as well as a “reserve” tobacco flavor that is only available in 15ml bottles for $10.49 when it is available as each batch is aged for two months before it is offered. The box contained 3 nice (and well filled) glass bottles with glass droppers attached and sealed with plastic. The kind of seal that you might get on a bottle of cough syrup. And a lot of styrofoam peanuts to protect them. Absolutely no odor came from the packaging as the bottles were well sealed indeed. The bottles were well marked with the company logo and website and proudly marked “Made In America”. On the back of the bottle was the name of the flavor, its “Born On” date and the level of nicotine content. The liquid inside is a clear with just very slight yellow tint. And when I went for the “sniff” test, I a most definite scent of Blueberry mixed with very light notes of Coconut as well as what I am going to guess is the Plum component. 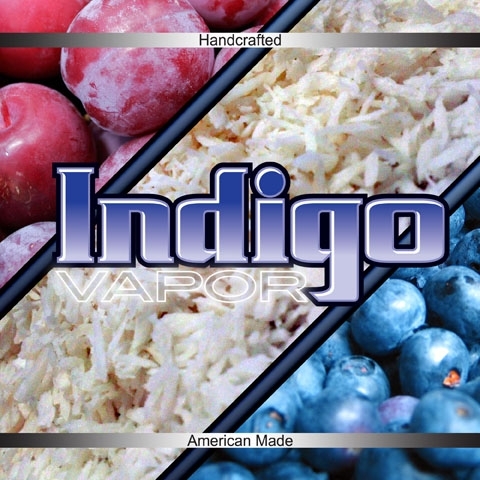 Indigo normally creates their E-Liquids in a standard 50/50 mix of PG/VG with your choice of 0, 6, 12, 18 or 24mg of nicotine. But if you ask them, they will mix as you prefer it. So I received my preference of 60/40 with 18mg of nicotine. A very respectable amount of vapor was produced which did carry the berry scent with it and a surprising amount of throat hit more than I would expect from a 60/40 mix at 18mg. This time I settle in at 3.7v. Mostly because the amount of throat hit has somehow noticeably increased. Enough to cause me to dial back on the power. Vapor production is the same and the nature of the flavor has undergone a change as well. While the Blueberry is still there, it is no longer in the foreground and is working nicely with the Plum aspect and the bit of a tart sensation still on the end of my tongue.. The Coconut now seems to be acting to tie all the flavors together into one cohesive mix. A very successful blending or even a partnership of all these flavors working in concert to create a very unique flavor. And a quite enjoyable vaping experience as well. As usual, I spent a lot of time collecting information from Tony about his operation. And this is the first time that anyone has sent me a picture of their mixing area which I have included with this review. Tony takes great pride in handcrafting his E-Liquid creations. Proper sanitary garb, including gloves and hair net, face mask and glasses, all stainless steel work surfaces which are sanitized repeatedly throughout the day along with the rest of the room (including the floor, walls and even the ceiling) at least once a week with a food grade sanitizer. All bottles and glassware (what we receive as well as what he uses to mix in) are washed and sanitized prior to use. His glass storage bottles are amber to protect from degradation from ambient light. The following is copied from his website about the quality of the ingredients used as well as a bit about his philosophy. 1. 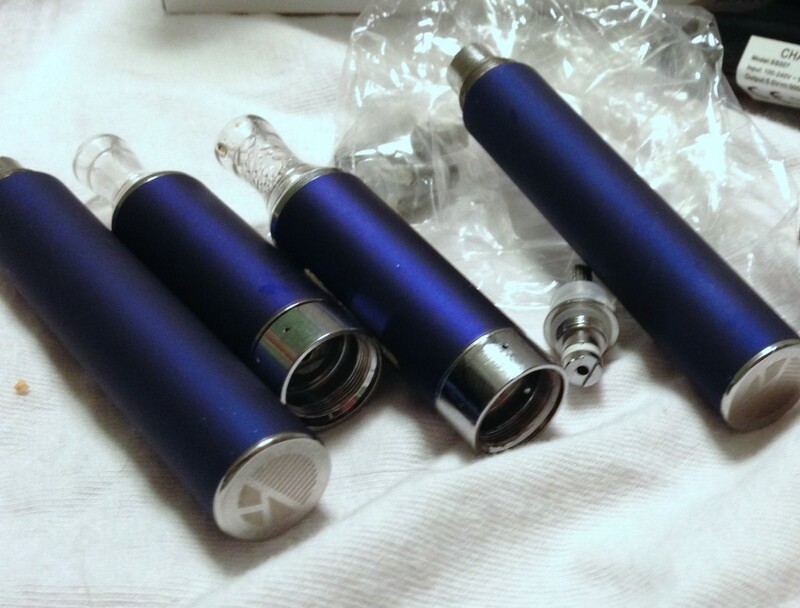 All flavors sold by Indigo Vapor are developed and produced in-house. 2. We use only the highest quality ingredients available. 3. We only use pharmaceutical grade Nicotine, Vegetable Glycerin (VG) and Propolene Glycol (PG). 4. We only use Generally Regarded As Safe (GRAS) approved flavorings. 5. All of our E Liquids are mixed to a 50/50 PG/VG blend as we have found that ratio to work the best across various hardware setups. We will however customize them by request. 6. We are particularly proud of our depth flavor, while staying true to the nucleus of the flavor being created – pure flavors improved! 7. Glass bottles. All of our products are sold in glass bottles including our sample packs. The main reason for that is safety and peace of mind. It’s important for our customers to know that there is absolutely no interaction between the liquid and the bottle that it’s stored in. For that same reason all of our bases and flavorings are stored in glass as well. 1. We don’t use dyes or colorings besides what are present in the base flavors. These serve no purpose other than marketing. 2. We don’t use oil based flavorings – all of our flavorings are suspended in PG. 3. We don’t use ANY flavoring that contain Diacetyl, Acetyl Propionyl or Acetoin. We very much consider ourselves a customer service company that happens to make eLiquid. I think that seems counter intuitive to some, but we can’t do what we do without backing it up by first and foremost serving our customers to the best of our ability and treating each and everyone of them the way we would want to be treated. Cheryl and I are both vaping enthusiasts and care about vaping a great deal as well as the community that surrounds it. And we feel that our feelings about what we do translate into our final product. I have really enjoyed reviewing this E-Liquid and I appreciate Tony going the extra mile to provide pictures of his mixing area as well as details of what he is doing behind the scenes to provide a safe, sanitary and absolutely vapeable product for us to enjoy! Vape like you mean it and I will see you again in a couple of weeks!